We build custom and standard hot water tanks & systems for a variety of applications and industries. 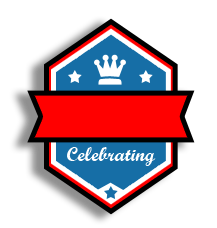 With over 100 years combined experience in manufacturing A.S.M.E. Code pressure vessels, quality and dependability can be assured in every vessel we build. 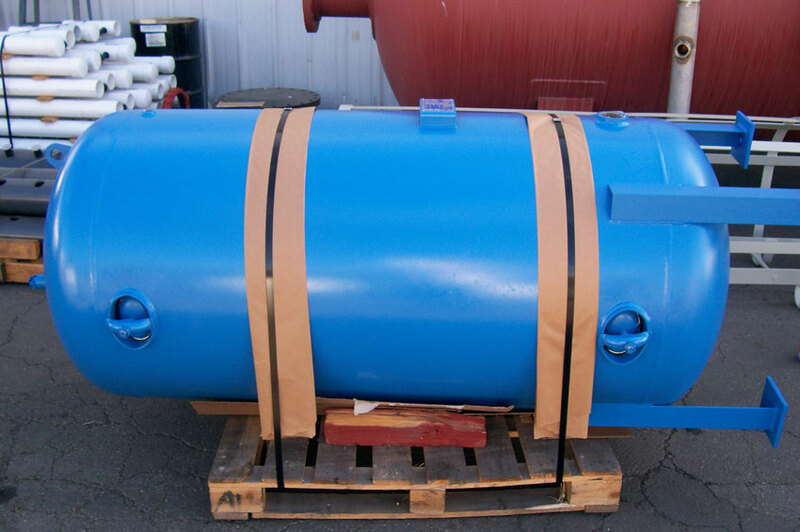 Custom hot water storage tanks are manufactured for 125 and 150 PSI. These vessels can be specified with all the necessary connection required for easy installation with most water heaters, boilers, or other water-heating devices. Typical applications include residential apartments, commercial buildings, schools, hotels, and industrial processes. Also available from the factory are other custom designs and fabrication for those tough projects. Please consult us with specification requirements. The first step in designing an efficient and economical hot water system required an analysis of two variables: storage tank capacity and recovery rates. Tables showing this relationship for various applications, such as schools, hotels, apartments, etc., can be found in the latest edition of the ASHRAE Handbook. Our talented sales engineering staff is available to assist in determining proper storage requirements for you specific application. Once the capacity has been determined, an economical selection focuses upon the physical limitations of the installation. Tank diameter and overall length are affected by accessibility, available floor space, ceiling height, and door width. As a general rule: for a given capacity, it is more economical to select a tank with a smaller diameter and longer shell. Please refer to the Tank Sizing Guide below. Additionally, lining choice will play an important role in both the total cost and the economic life of the vessel. Local water conditions, and accessibility for maintenance or repair, should be considered when choosing an appropriate protective lining. South Gate Engineering offers a full line of stock hot water storage tanks. These tanks are available in eight sizes, ranging from 185 gallons to 591 gallons. Stock hot water storage tanks are manufactured and certified to the A.S.M.E. Code to 150 PSI. These tanks include all necessary openings required for easy installation with most water heaters, boilers, or other water-heating devices. Typical applications include residential apartments, commercial buildings, schools, hotels, and laundry facilities. These tanks come factory lined with a high performance epoxy phenolic coating that is NSF approved for potable water and is excellent for temperatures up to 200 degrees F. On the exterior, these tanks are finished with a coat of epoxy shop primer. In addition, these tanks can be supplied with optional thermal insulation, either polyurethane spray foam or rigid fiberglass with aluminum or metal jacketing. South Gate Engineering stock tanks carry a 3-year conditional warranty. Please consult the factory for details on this warranty. 1. Polyurethane Spray Foam insulation with acrylic sealer. 2. Rigid fiberglass insulation with aluminum or metal jacketing. South Gate Engineering Hot Water Generators are used as a source for domestic hot water through the use of an integrated copper coil tube bundle. This tube bundle transfers heat from either steam or heated water to the water inside the tank through convection. South Gate Engineering’s Hot Water Generators are designed and certified to the A.S.M.E. 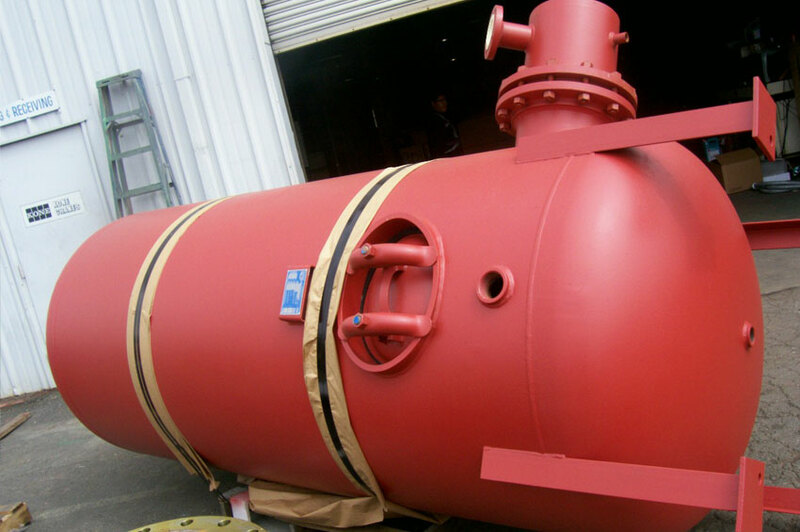 Pressure Vessel Code and are available in either vertical or horizontal styles. Standard hot water generators come in 125 PSI and 150 PSI at 200 degrees F. Other design pressures and temperatures are available Copper tube bundles are available in many sizes, with tube sheets available in carbon steel, stainless steel, or cuprous-nickel. Consult the factory with your custom requirements. When a copper coil tube bundle is installed into a horizontal tank, the optimal heat transfer is obtained when the coil length is 2/3 of the tank length. Coils should not be less tank half the tank length or greater than 80% of the tank length. When a copper coil tube bundle is installed into a vertical tank, the optimal coil length is equal to the tank diameter. Coils should not be less that half the tank diameter in length or longer than the tank diameter plus 6 inches. The most basic and the most common type of heat exchanger construction are Tube and Shell. South Gate Engineering can provide shells manufactured to ASME requirements and also provide internal coils manufactured to current double wall requirements. All South Gate Engineering shells are built in strict conformance to A.S.M.E and/or customer specifications. South Gate Engineering’s ability to paint and line tanks in house, allows for freight savings especially on large tanks. South Gate Engineering also installs coils after paint and lining to minimize customer labor costs and ship complete unit.